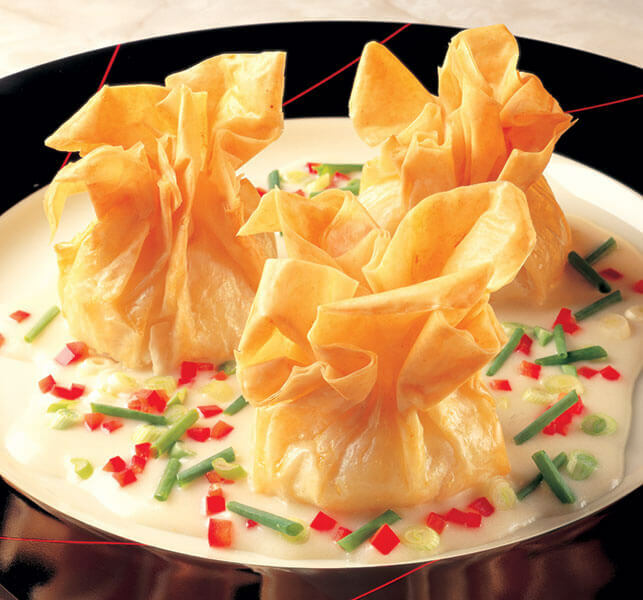 Marinated beef tenderloin is joined in flaky phyllo pouches by stir-fried mushrooms and bell peppers in these Eastern-inspired delights. In large bowl, combine soy sauce, sherry, 2 cloves garlic and 1 tablespoon ginger. Add beef and marinate while preparing rest of ingredients. Remove beef from marinade, reserving 1/4 cup marinade. In large wok or skillet, heat 1/4 cup peanut oil until it smokes, add beef and sauté quickly for 3 minutes. Remove and place into bowl. Add rest of peanut oil with remaining tablespoon ginger and 2 cloves garlic. Add mushrooms and peppers and stir-fry for 1 minute. Add 1/4 cup marinade, sesame oil and brown sauce. Heat thoroughly and toss with beef in bowl. Chill completely. Prepare large Phyllo pouches according to directions for pouches linked to the right. Fill each pouch with 1/4 cup of beef mixture. Brush with butter. Freeze for 10 minutes. Bake pouches in preheated 3501/4F oven for 20 to 25 minutes or until golden brown. Prepare Ginger-Lime Sauce, spoon 1/4 cup of sauce in center of plate, and place 3 pouches on sauce. Combine all garnish ingredients. Sprinkle on sauce. 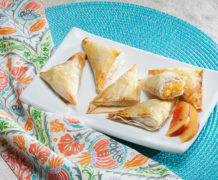 These flaky pastry desserts are sure to delight fruit lovers with a warm filling of cardamom-spiced peaches. 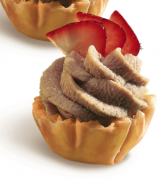 The classic combo of chocolate and strawberries meets creamy and crunchy in these Mini Phyllo Shell desserts.